There have always been rumors of Lesbian love affairs associated with Eleanor Roosevelt. Eleanor, a famous woman on her own, a beauty in her younger days, intellectually stimulating, caring mother and wife. We learn a lot about her, but this is Lorena Hickok’s story, and this story is told from her perspective. In and out of the White House, in New York apartments, and out in the world, the story goes from President Roosevelt’s death back to Hickok’s early life. A hard scrabble child, she had a difficult childhood, no money, turned from her home at a very young age, worked in a circus and became a journalist. And, then, she met Eleanor. Amy Bloom has captured the essence of Hickok’s and Eleanor’s love story. From the Governor’s mansion to the White House, we learn a great deal about Eleanor, but sometimes more about FDR. This is a book that gives us the real deal about the man, his needy children, and those who surround the President and First Lady. FDR died in April, 1945, and we hear about his funeral from Eleanor’s perspective. The storyline revolves around FDR’s life and death, and the love affair between Eleanor and Hickok. Such fine writing by Amy Bloom, we enter the realm of a love not talked about much before this time. Told from the perspective of the other woman, this is a love story to remember. This is a heartbreaking story of hidden love, a novel based on what many believe to have been the affair between Eleanor Roosevelt and journalist Lorena Hickok. 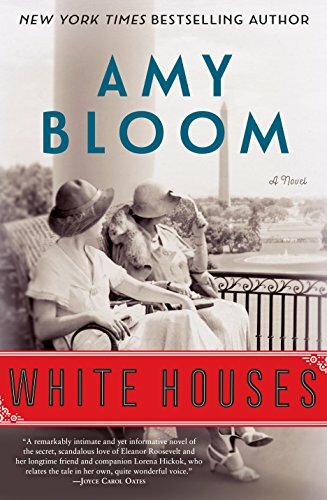 Hickok is the narrator of this novel, which author Amy Bloom has created from the documentation available, including many letters between the two women. Many other letters, Bloom notes, were destroyed. When “Hick” met Eleanor in 1932, the latter was the wife of the governor of New York, Franklin Roosevelt, who was in his first campaign for president. Eleanor was rather shy and had spent much of the previous years consumed with the tasks of motherhood and dealing with her overbearing mother-in-law. She wasn’t at all sure she was cut out to be first lady. Despite their differences in personality — Hick was brash, outspoken and not too secretive about being a lesbian; Eleanor was dignified, private and patrician — the two soon found themselves very attracted to each other. The novel traces their decades-long love affair of the heart and mind, sometimes together and other times not, but always striving to hide a situation that, even now, would be a huge scandal. Franklin, of course, had his fun with other women, and Eleanor was expected to look the other way. Her relationships with her needy, manipulative grown children were fraught with emotional pitfalls. Through it all, Hick was her rock, even when rumors swirled around them. This is a lovely story, with some joy as well as the inevitable sadness that comes from having to hide one’s true feelings from the world. Hick’s voice is strong and true. Eleanor, while not as strongly drawn by the author, develops and grows as the story proceeds. I don’t know how much of this is true, but it’s a good read. This is a tremendous book on so many levels there is not enough space to examine them all. At the center of this great novel is the love story of Eleanor Roosevelt and Lorena Hickok, a journalist. Lorena, known as “Hick,” lived in the White House with Eleanor for a long period time, until love cooled. They reunite after FDR’s death, which is where the narrative begins. The story then moves seamlessly between their early years and the “present.” It is story of struggle within relationships, the triumph of love and the inevitability of loss. In an afterword, Bloom notes that the White House staff always cropped Hickok out of photos. In White Houses, she’s in the center of the picture, where no one is likely to forget her.